Cub Painted Daisies White Kraft Paper Bags 250 8x4-3/4x10-1/4"
Cub size Painted Daisies Shopping Bags by the carton are made from recycled white kraft paper. Green Way ® Eco-Friendly Packaging. Bags are 100% recyclable and contain minimum 40% post consumer recycled content. This is a Nashville Wraps exclusive design! Made in the USA. 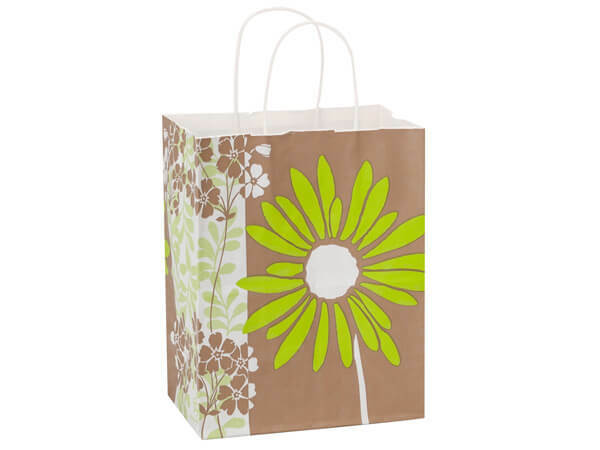 Our Painted Daisies Shopping Bags are made from recycled white kraft paper and carry the Green Way® logo. Bags are 100% recyclable and contain minimum 40% PCW content. These floral print bags feature fresh green daisies against kraft and white with a subtle leaf pattern in the background. Bags have kraft paper twist handles and are available in bulk cartons, small packs or an assortment. Made in the USA and individually UPC coded for easy resale.